The Special Forces comprise the special operations units of the United Nations Space Command. By March 2555, the UNSC Special Forces is headed by Captain Annabelle Richards, who reports directly to the Office of Naval Intelligence's Commander-in-Chief, Admiral Serin Osman. Naval Special Warfare Command (NAVSPECWAR) is a major special forces division under the oversight of UNSC Naval Command. The branch includes the Orbital Drop Shock Troopers, operatives of the now defunct ORION Project, and most of the SPARTAN-IIs. The SPARTAN-IIIs also served under NAVSPECWAR until early 2553, when they were folded into the independent Spartan branch. NAVSPECWAR specializes in covert operations, assassinations, and conducting high-priority, high-risk operations against enemy forces. NAVSPECWAR also includes Naval Special Weapons (NAVSPECWEP), under which the ODSTs and the SPARTAN-IIs serve. Some NAVSPECWEP units fall under the operational supervision of Section Three within the Office of Naval Intelligence. The group has a large amount of operational and command flexibility. Although this office is technically subordinate to both the UNSC Naval Command and the Unified Ground Command, UNICOM primarily has oversight of NAVSPECWEP special forces. Spartans are the most skilled and disciplined soldiers in service to the UNSC. SPARTAN-II and SPARTAN-III personnel took part in intense training from childhood; most saw combat by their early teens. The SPARTAN-IIs wear performance-enhancing MJOLNIR Powered Assault Armor, whereas most SPARTAN-IIIs wore Semi-Powered Infiltration armor. After the Spartan branch's establishment, NAVSPECWAR still maintains operational command over Blue Team. Gray Team - formerly; as of September, 2558, under authority of the Office of Naval Intelligence. 7th Battalion troops heading toward an enemy position on the Ark. The Marines Corps' Orbital Drop Shock Troopers (ODST) are an important part of the UNSC's offensive operations. Disciplined and skilled, they drop into the most hostile areas via SOEIV drop pods. They attempt to complete some of the most difficult tasks in hostile areas, such as clearing enemy ground forces or establishing landing zones for incoming dropships. Unified Special Warfare Command (USW) often simplified as Special Warfare Command (SPECWARCOM), is a special forces branch under the authority of Unified Ground Command. [note 1] It maintains oversight of special operations carried out by the UNSC Army. Given UNICOM's authority over the UNSC Marine Corps on the whole, it is possible that USW also oversees Marine special force units apart from the ODST, who fall under NAVSPECWAR's authority. ↑ Most sources refer to the organization solely as "Special Warfare Command". The "Unified" part of the name is extrapolated from various sources but it has never been used directly in official material. The introduction to the Halo: Reach game manual refers to Colonel Urban Holland's group as "USW". 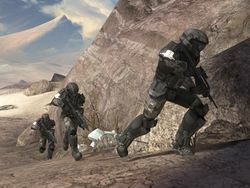 In several pre-release materials for Halo: Reach (including the multiplayer beta and the pre-order bonus card for the Recon helmet), Special Warfare Group Three is indicated to be under UNICOM's operational authority. Based on this information, "USW" can be inferred to mean "Unified Special Warfare". The wiki uses this title for the sake of consistency with the naming of Naval Special Warfare as well as to more clearly differentiate the two organizations.